Coconut oil is known throughout the world for for being a hair tonic, an edible oil, a deep penetrating massage oil and for making your skin feel super smooth. The natives where coconuts are found, massage the oil onto their skin as it is believed to protect their skin from the harmful rays of the sun. So this natural oil, in it’s organic form can protect the skin far better than our processed and artificial sunscreen lotions. We investigate what makes coconut oil so beneficial for the skin by looking at the respective properties and the constituents, that make them beneficial for the maintenance of skin health. These are comprised mostly by medium chain fatty acids (triglycerides) and massing it onto the skin keeps it smooth as a babies behind. Because of the presence of these fats, the moisture content of the skin is retained, as the fats keep the moisture locked in through the pores. Ingestion through the regular consumption of the oil deposits fats under the skin, thus maintaining it’s smoothness and vitality. There is no real difference between these 3 fatty acids and the medium chain fatty acids, but since they do have their own contributions, it’s still important to mention them individually. They have strong antimicrobial and disinfectant properties and when applied, coconut oil protects the skin from microbial infections that can enter the body through your pores or open wounds. Even if you ingest the oil, the microbial action can be experienced, as the fatty acids boost the immune system when converted to monolaurins and monocaprins. The three fatty acids are easily broken down chains of fatty acids – contributing to usable energy in an efficient and quick manner. This gives your energy levels a major boost before a workout, which is the reason why these powerful acids have been linked to weight loss and management. A great way to improve the quality of your skin is to lose excess weight, which reduces stretch marks and folds in the skin. Maintaining a healthy, toned body means that the skin has a tight grip around the muscles and bones. Vitamin-E is essential for healthy skin growth and repair of wear & tear on the skin. It keeps the skin smooth and protects it against cracking. It great for premature wrinkling and aging of the skin, because of it’s good antioxidant properties. Coconut oil has been popularised and praised for its anti-aging properties, as 100 grams contains about 0.1 mg of vitamin E, thus improving the skins quality. Coconut oil is superbly rich in many proteins and these keep the skin rejuvenated and healthy, both externally and internally. Tissue repair and cellular health are maintained with proteins. Damaged cells are replaced at a normal rate with a healthy of flow of proteins, whereas a person with a protein-deficient diet heals far slower and can develop more obvious scars due to the extended healing time. The beauty of coconut oil is that it does not become rancid, making it highly beneficial for your skin. It also works for a longer time, without it becoming rancid. Cracked lips can become a discomfort, worry and embarrassment. Many lip balms leave your lips feeling sensitive and dry after you have stopped using them. You also need to take into consideration that many of these balms contain chemicals and it’s possible to consume these toxins accidentally. Even if the gel reads edible, you don’t want to ingest those chemicals. Coconut oil is a wonderful alternate. The results are immediate and even if you ingest some, it will only benefit you. There is no better skin softener than Coconut oil, which is great for alleviating hard and dry skin conditions. It’s so simple – take a thumbnail or two of coconut oil, rub it gently between your palms once or twice and then massage lightly onto your face, hands and even better, your entire body. If you suffer from cracked feet due to prolonged standing or excessive cold, the cracks won’t vanish, but your feet will become softer within days by applying coconut oil to the affected area. Natural exfoliating or grainy materials like sugar or salts can vastly improve the effects. You’ll successfully scrape off all the excess dead skin and clear out whatever impurities that block the pores and your skin won’t feel irritated. combining coconut oil with the grainy, exfoliating material, leaves your skin with closed pores, even color and a soft texture. Coconut oil draws out impurities and is the ideal makeup remover. You can remove the makeup from your eyes and face , without worrying about using harsh chemicals getting into sensitive or delicate areas. 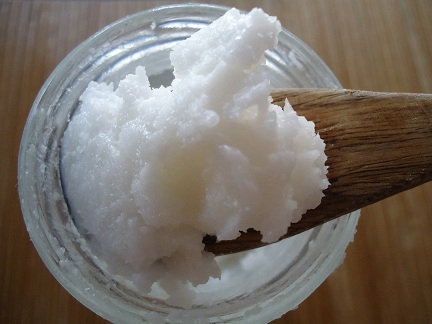 Coconut oil is said to be good for several skin disorders such as psoriasis, acne and eczema. The research speaks of its protein content, since the replacement of dying or sick cells with healthy new cells can occur with various skin disorders. Coconut oil not only treats the infection by battling the microbial bodies, it also heals the damage or the visible scars of that skin disorder. There are various ways of applying and using using coconut oil and it can become confusing. Buy a tub with a broad opening of pure organic coconut oil. In colder climates you’ll find coconut oil can be solid and in warm temperatures, it comes as a liquid. For skin care use, you only need a minimal amount to create a protective shield on your skin that will last for a long till the next day or even longer. If you use too much and too often, your skin lands up as an oily mess and will start to look greasy or shiny. So all in all – with a little effort and a little coconut oil that goes a long way to making your shin healthy.